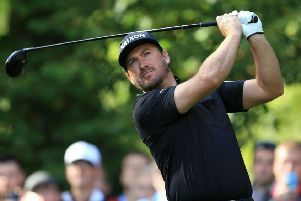 Twelve golfers continue on the road to golf’s 147th Open Championship at the famed Scottish Links course of Carnoustie after regional qualifying at Fairhaven Golf Club this week. Longridge Golf Club’s Mark Young took pride of place at Fairhaven on Monday, when he made the short trip to the Fylde coast and was one of five to finish with a par total of 72 in one of the 13 regional qualifiers. Final qualifying takes place at St Annes Old Links on Tuesday. Sharing first place were Benjamin Firth (Leeds Golf Centre), Adam Stone (Lancaster), Welshman Lee Rooke (Royal St David’s) and James Robinson (Southport and Ainsdale). But after finishing with an eagle on the par-five 18th, Young was the man of the moment. Fellow qualifier Phillip Kelly, representing the Coastal Property Group Lytham, had sixth place to himself with a score of 73. Kenwick Park’s Ash Turner, Hartford’s Rhys Nevin and Clitheroe’s Mark Ashworth all tied for seventh place with a score of 74. Three players tied for 10th to complete the qualifying group. They were James Murphy (Northenden), James Newton (Prestbury) and Callan Barrow (Royal Lytham and St Annes), who all finished with a score of 75, three over. Players to miss out included RL&SA’s Thomas Richardson, Sam Turner, Nicholas Peoples, Harvey and Louis Talarzyk, St Annes Old Links’ Gary Potter, Tom Ryder and Sam Avery, Herons Reach’s Jake Dudley and Richard Bowman, and Simon Wilson of Lytham Green Drive. Knott End Golf Club has a new professional in Jonny Salisbury. Jonny started playing golf at Lancaster GC at the age of 13, and by 17 he was playing off a scratch handicap and competing for Lancashire. He studied at Myerscough College and turned professional at 21, competing regularly on the PGA North Region Circuit. He completed his PGA degree in 2009 under David Sutcliffe at Lancaster GC. The last two years have seen him based at Preston Golf Club working with head professional Andrew Greenbank. He has been teaching golf for almost 10 years and has gained a reputation for coaching juniors. He’s already building a reputation at Knott End for coaching, fitting clubs and adapting them. Knott End Ladies played the qualifying round of the Ping 4BBB. won by Jean Molloy and Marion Hill with 40 points. Runners-up were Betty Lawrenson and Jenny Watt with 35.